Now our popular "Holey Roller" bars are available for your 2008-2013 Road Glide and Road King. These fit Road Glides and Road Kings. These bars will NOT Harleys with the "batwing" fairings. Complete cable kit is for 2008-2013 Harley-Davidson Road Glide or Road King with ABS. 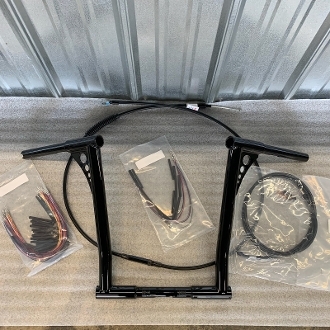 Kit includes dual front black brake line, black clutch cable, throttle-by-wire extension, and wire extension harness. If you have a CVO or Police model this cable kit might not work for your bike, but we can get you one that does. Please contact us for more information!